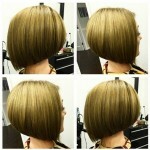 Home » Popular Hairstyles » Straight A-line Bob Hairstyle for Summer – Great Hair Color! Straight A-line Bob Hairstyle for Summer – Great Hair Color! Dark hair does look fabulous in the latest A-line bobs. It’s a natural look compared with the many dip-dye, ombré and balayaged colours we were bombarded with last year. However, this short haircut is very subtly highlighted with cocoa-brown in the lower lengths, warming up the cool, café espresso base colour. In addition to this new colour idea, this A-line bob is asymmetrical in a different way, as the smoothly rounded back moves down to sides which are not only different lengths, but have different angles of graduation, too. The longer side is steeply angled and styled dead-straight down to the lightly textured tips, whilst the other side features a disconnected layer at the front at just a very slight graduation from the back. The model is wearing this innovative new look with a centre-parting, which works well on oval faces. If you’re one of the majority, who doesn’t have a perfectly oval face-shape, just move the parting to one side and that’ll fix you up for a very trendy and flattering new look! Find more latest short hairstyles on hairstyles weekly!